You might be thinking, "that is not dinner." Most of you are probably thinking that. Or you're thinking, where are the greens? Where's the substance? The stuff? Well, hear us out. It's two days before Christmas, which means that you're probably a little tired, a tiny stressed (in that fun way that Christmas can sometimes be stressful), and you're rationing out your energy. So what you need, really, is a strong drink and a bowl of Pasta e Fagioli. Never had it before? 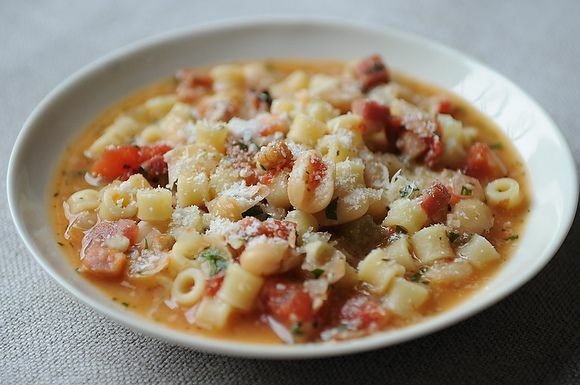 Pasta e Fagioli is like SpagettiO's 10 years later, after a semester in Italy. It's comforting and simple and requires minimal focus while you're making it, which is really just our way of saying that you should make the Negroni first. We're assuming you have half an onion, 1 garlic clove, a can of chicken broth, gin, and some dried oregano. If not, add those to the shopping list, too. 1. If you want to make your negroni first: Stir gin, Campari and vermouth in a shaker or mixing glass filled partway with ice. Strain into a rocks glass filled with ice. Garnish with an orange twist. 2. In a heavy saucepan cook bacon over moderate heat, stirring until crisp. Add onion and garlic, stirring until onion is soft and transparent. Add celery. Add broth and simmer, covered, for 5 minutes. 3. In a bowl mash 1/3 of the beans, then stir them into the onion mixture along with the remaining whole beans, tomatoes, and oregano. Simmer the soup, covered for 15 minutes, or until pasta is al dente. Then remove from heat and let stand, still covered, for 5 minutes. 4. Stir in parsley and top with (lots of!) Parmesan. Dig in! Are you supposed to cook the pasta separately or in the soup? I assume it's in the soup since it said to simmer until al dente but it never said when to add the pasta. thanks! First, your grocery list calls for 1 ounce of Campari and 1 ounce of sweet vermouth; impossible to buy that amount. It should list just those items. Second, your instructions for the negroni does not list how much gin, vermouth and Campari. Only because I learned to make them on a trip to Tuscany did I learn the recipe of 1 ounce of each. 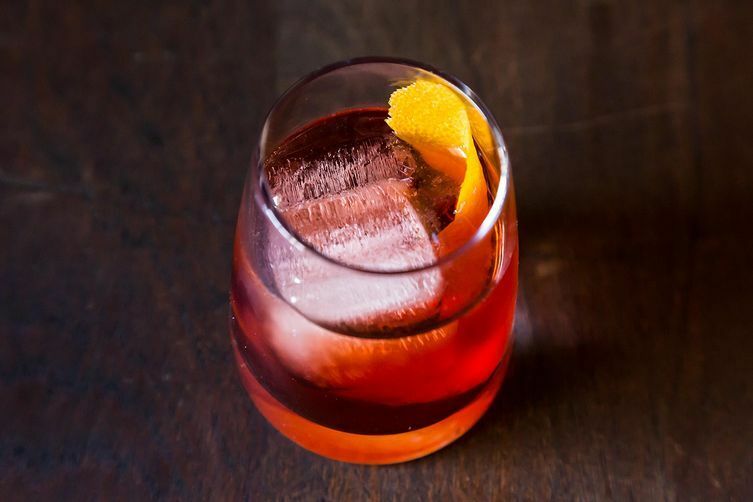 For my personal favorite negroni I use Antica vermouth, a dash of orange bitters and a little curl of orange peel. Sounds amazing -- I'll have to try it!